To first set-up the episode, we start with the Doctor being date-raped by an Egyptian queen Nefertiti after saving her. It seems that the Doctor has a weakness for feisty ladies since the queen refuses to leave him alone and comes in the TARDIS with him whenever he is called to Earth in the future. At this point in the future, we have a space defense system and they need the Doctor to investigate why that ship is headed towards Earth, and if it's hostile, the Doctor needs to stop it before they are forced to blow it up. After being tasked with this mission, the Doctor brings in a big game hunter Ridell, the Ponds (including Rory's dad, Mr. Weasley a.k.a. Bryan) with the Queen in tow to the TARDIS to help him with this newest adventure. The cargo, it turns out, is the titular dinosaurs in the titular spaceship. But why is it deserted? What happened to the people navigating this ship? And how did the dinosaurs end up there? While exploring the ship, there's a lot of talk between Amy and the Doctor about the new companions who are part of the Doctor's "gang." You can bluntly see the jealousy that Amy feels especially since the couple haven't seen the Doctor in almost ten months since the events of the Asylum. She gets fearful that the visits have become more and more infrequent ever since the last season and thinks this means that with the new members of the group, the Doctor will eventually replace them. It's kind of sad to see this happening slowly but surely. Like ANNIE HALL, we know this is relationship is ending and there's no ambiguity here. It will end tragically so it's a little wrenching to see the characters head towards this final point slowly over the next four episodes. What follows is a rather light hearted race against time to save the gang and the dinosaurs from what turns out to be a deranged bounty hunter. What I enjoyed about this episode was the banter between all of the cast involved. Seeing Bryan being perpetually amazed at what's going on is pretty funny compared to Rory's indifference to the action around them. Then there's Ridell's super sexist point of view. While it felt really like an easy set-up with him being paired with both Nefertiti and Amy, two very strong female characters, was a fun, kid-friendly way of dealing with this issue. How do the dinosaurs hold up, you say? I think they look freaking great. The visual punch that the dinos pack is not anything close to something like JURASSIC PARK. Rather, it's a testament to the fact that this how's production values and popularity have grown to the point of allowing something like CGI dinosaurs being allowed in the budget. 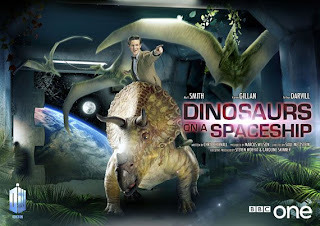 Things get to be a little fun, with the Doctor meeting a triceratops and Rory and his dad being chased by pterodactyls, when we meet the big villain of the episode, a bounty hunter named Solomon (Mr. Filch from the Potter films). 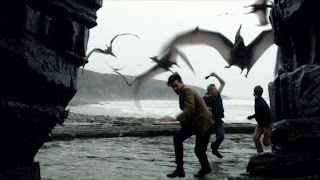 After roping in the Doctor to repair his raptor-mangled legs, Solomon gives us the exposition for the episode. The ship that the gang is in was originally a Sirulian ship which was meant to a be an intergalactic Ark. As it turns out, very ironically, that the only species that could handle the ship and space was the dinosaurs. Solomon came upon the ship and along with his annoyingly voiced robot companions, they systematically woke up and jettisoned all of the Sirulians that were asleep for the trip in order to gain control with the ship. However, Solomon could not figure out how to pilot the ship, so it went into emergency mode and came back to Earth bringing us to right now. By the time that Solomon kills the nice Triceratops that the Doctor befriended, you can see him getting completely pissed and wanting to get rid of the bounty hunter. It isn't until Nefertiti offers herself as a bounty that they are provided with an opportunity to do just that. When it's all said and done, you see the Doctor win just in the nick of time as is to be expected. Of course, you also know that the Ridell will be more open minded by the end of the episode, and Rory and Bryan have a touching father and son moment in which they save the day. But what really interested me were some specific details. The first one was when Solomon asks the Doctor to fix his raptor-mauled legs, he scans him. This device scans the person or object and ascertains their value. Harkening back to the Asylum, it seems that the Doctor is worthless. I get that it's meant to show once again that since the events of the last season, the Doctor's death is well-known and he has been keeping a "low profile" ever since. What I find interesting is the the fact that in each episode this season we have someone that somehow knows that he's alive or that was able to call him up in case of an emergency. This bears the question, who knows that he's alive? Or if the Doctor is making house calls, why did he deems these people important enough to let him know he was alive? Another big point of discussion is the fact that the Doctor outright kills Solomon by jump starting his ship and then using Solomon's ship as a target for the incoming missiles with the bounty hunter and his robots in it. 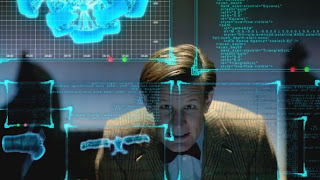 This is seen as a rather malicious and evil on the Doctor's part, and mind you, I had that first initial reaction as well, but the thing is, we have seen this type of behavior on the Doctor ever so subtly creep in with every one of his incarnations. This mostly shows up whenever the Doctor is left without companions or is in the near end of his particular regeneration cycle. Even last season as the Doctor scrambled to get answers about the Silence, he was seen tearing apart Daleks like it was no one's business, so I think everyone needs to chiiiiiiill. What I will say is that while I enjoyed Bryan's presence in the episode, the way that they pay off his appearance in the show is a little lame. Him being there felt like an excuse to reconcile or repair some relationship issues with his dad. I think that's fine and dandy, but the way that it was done where Rory patches Bryan up after he gets shot by the robots, or the way that father and son are the key to piloting the ship just felt a little...cheesy. I understand that he will be coming back in an upcoming episode, but given that I don't know the context, I can only think of the episode as a standalone story and that had to be one of the weaker aspects for me. Overall, I've got a few problems with parts of the lame writing or the set-up for these last two episodes, especially with "Asylum of the Daleks." Parts just seem to be just very poorly written What I have enjoyed were hints here and there of a larger issue and plot arc going on in this season. I hope we see more and more of the threads that were left dangling last season start to close. 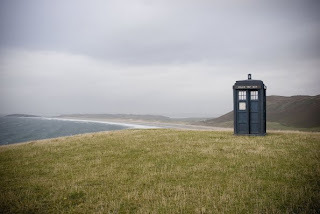 With that being said, I hope that this first half of the season isn't 100% about the Doctor's need for companions seeing as this plot line was already done quite well with David Tennant. Then again, show runner Steven Moffat is a smart guy, and I trust him to build on his already crazy version of the Doctor.